Public servants must be the part of the solution to the various issue that’s plaguing this country. 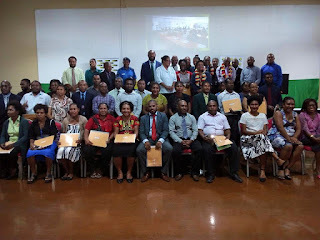 That’s the strong remark from the Minister for Public Service, Elias Kapavore to 47 public servants who graduated with Certificates in Leadership and Governance today at the Institute of Public Administration (IPA), Port Moresby. The public service is the workhorse of the country and he wants the graduates to use what they have learned to better the service they provide to the people of PNG right through to the most rural areas. Kapavore said issues like corruption has crippled the public service machinery and it has to be addressed because of the dependence many have on the public sector to provide the services. Mr. Kapavore was referring to the SP Brewery Foundation Inc. through its SP Brewery Government Scholarship that made the training of the 47 public servants possible under the Public Private Partnership program. The ministers further added that PNG’s Human Development Index in 2009 was at 147 out off 188 countries, but in 2017 it dropped to 154, which he said is a big step back, something which the public sector must also work on to improve. Finally, Mr. Kapavore thanked SP Brewery Foundation Inc. in partnership with the Department of Personnel Management and IPA, in making it possible to up skill the public servants to contribute more to achieving their department’s goals, but more importantly, work to lift the public service machinery in the country.